I’m a 3 customer. In fact, I just used my 3 MiFi dongle to start writing this blog post in the “cloud”, from my comfy spot in Boston Tea Party in Clifton Village. I’ve been using 3 for mobile internet for years, and I find them a lot more reliable than cafe Wi‐Fi. And their customer service has been good, too. So, when 3’s agency got in touch and wondered if I’d like to review anything running‐related from the iPhone section of the 3 store, I couldn’t see any reason why not. I chose this Jabra Rhythm headset. Running is hard on headphones and earbuds. They’re at risk from rain, sweat and repetitive strain on the cable, among other things. I’ve got through several pairs since I started jogging, so it’s always good to try out something new and see if I can put another option on my list. 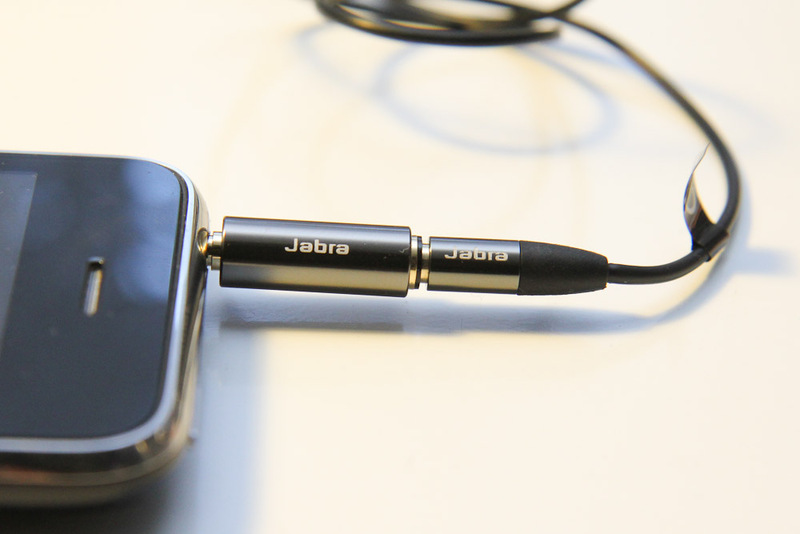 The Jabras are my preferred type of headphones, noise‐isolating earbuds. These also feature an iPhone‐ and Android‐compatible remote control and microphone. 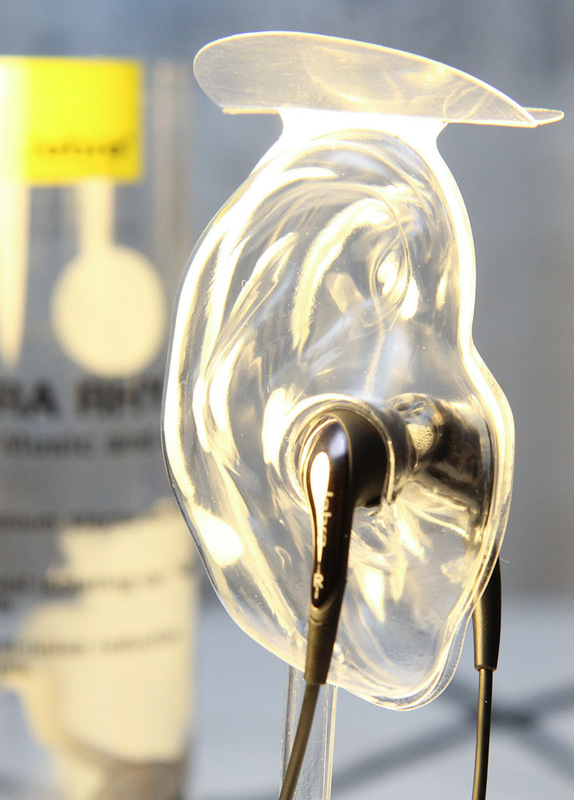 They arrived in a distinctive tube with the earbuds inserted into translucent plastic ears. I put them to one side rather than throwing them away; you never know when you’ll need a pair of translucent plastic ears. The Jabras look good, and the plastics are a decent quality. The lead is nice and long, with a gold‐plated 3.5mm jack. They certainly feel better in the hand than the standard Apple headphones that come with the iPhone, though not as good as my current headphones, the Sennheiser MM70. But given that the Jabras are £25 and the Sennheisers are £50, that’s hardly a surprise. The soft rubber earbuds come in the standard three sizes. 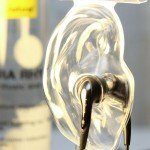 Luckily my ears are apparently average, so I never have to fiddle with the small and large pairs that come with this style of earbud. The Jabras fitted snugly and comfortably. 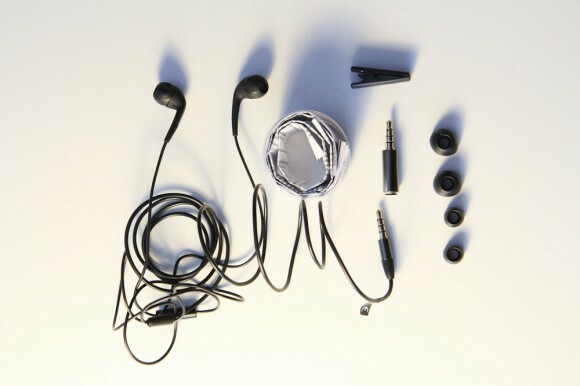 The microphone and remote control drop from the left‐hand earbud, just like my Sennheisers, so even if the earbuds weren’t obviously‐shaped, I could still easily tell the left from the right. The supplied clip grips clothes and cable fine. The gold‐plated 3.5mm jack looks nice, emblazoned with the Jabra name, though I’m not convinced that the cable’s strain relief is going to be effective. One oddity was the adapter that came in the tube. It’s listed on the packaging itself as a “phone adapter”, but it’s not mentioned in the paper instruction sheets. Its plug is identical to the plug that’s already on the end of the cable. 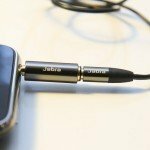 The headphones didn’t need this adapter to work on my iPhone 3GS or my (Android) Samsung Galaxy S Wi‐Fi – everything, including the remote control and the microphone, seemed to work just fine without it. Which is a good thing, as stacking the plug and the adapter makes for an ungainly and fragile‐looking connection that might easily bend or snap in a pocket. 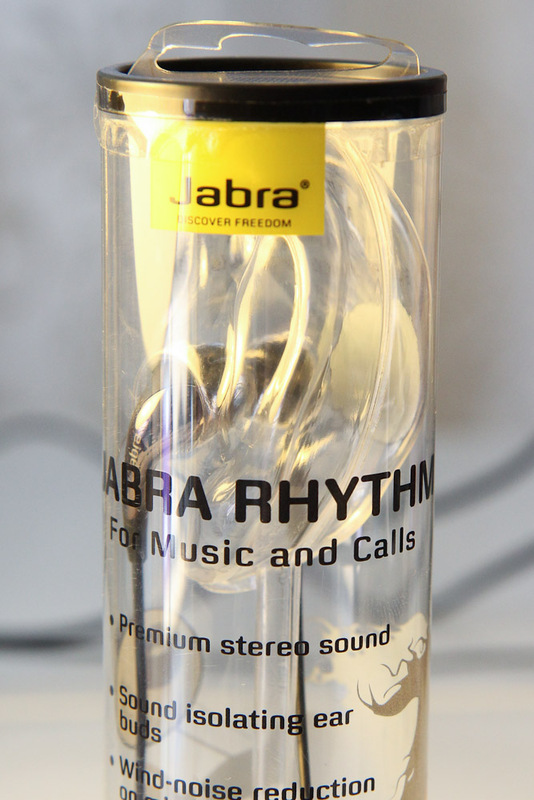 Being called “Jabra Rhythm”, I was expecting the Jabras to be a bit bass‐heavy. There’s a big market out there for people who live in the bass end of their preferred music’s frequencies, and a lot of headphones are aimed squarely at them. The Jabras didn’t fail to disappoint on that score, emphasising the bass end far more than my preferred Sennheisers. I won’t knock them for that per se; that’s more a question of taste than quality, and the rest of the sound was well‐reproduced, with a detailed top end, to my inexpert ears, at least. I’ve certainly listened to £25 headphones that sounded a lot worse. Since I’ve given up my commute to work, jogging is one of my chances to catch up on my backlog of spoken word podcasts, too (my long run of the week is often accompanied by Build and Analyse.) The Jabras were good for the spoken word; voices sounded rich and clear. The noise isolation buds are comfy, and work just as well as the ones on my Sennheisers. They pick up some physical cable noise, but no more than any other similar earbuds I’ve tried. One big disappointment is the lack of volume control. The remote control is a single button with the play/pause/next track/answer calls/etc. function of the middle button on standard Apple headphones. This single, multifunction button works great on the Jabras, with a nice positive click, but they lack the volume up/down buttons. This is a real loss for runners, as running is one of those activities where it’s tough to reach the volume control buttons on the music player itself, which is likely in an armband or a tight‐fitting shorts pocket, or an audio waist pack, or what‐have‐you. One vaunted feature of the Jabras – and presumably a reason that a phone company like 3 sells them – is the microphone. This has “wind‐noise reduction” technology built in. There’s a really good way to test a microphone’s wind‐noise reduction around here, and that’s to take it for a jog down the open ground of the A4 Portway, by the River Avon. That has the bonus of adding road noise into the mix, too. So, on my jog last Wednesday, I took along the Apple earbuds that came with my phone, my favoured Sennheisers, and the Jabras. I spun the recordings into an Audioboo so that you could compare all three. Incidentally, if you think you have problems untangling your headphones, try untangling three different pairs that have been stirred in a jogger’s pocket for ten minutes. Not fun. The crunching sound from the Apple headphones is them bashing around, unsecured by a clip. They don’t sound bad, but they don’t sound good. The Sennheisers did better, with less rubbing noise, and the voice punching through more clearly through the background. The Jabras, however, were pretty bad. Muffled, with a lot of obvious wind noise. My voice didn’t come through anything like as crisply as it did with either the Apple earbuds or the Sennheisers. This isn’t a big loss for me, mind you. I’m never going to be that guy jogging along in the Apple adverts, adding “to‐do” items to his task‐list with Siri as he goes. I’m self‐conscious about talking to myself in public, plus I don’t normally have enough breath or concentration to jog and talk at the same time. 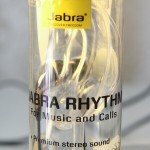 But if you bought the Jabra Rhythms to take advantage of their call quality, I think you’d be pretty disappointed. Good quality materials for the money. Good sound reproduction, though a little bassy for my taste. “Headphone adapter”, whatever it’s for. If you need to use it, you won’t like it. And it could do with a mention in the instructions. I’d have liked these headphones much more if they’d spent the money sucked up by the wind‐noise reduction technology on fitting them with volume buttons instead. At £25 they’d have been a tempting option compared to spending twice as much on another pair of Sennheisers when my current set die. But without the volume controls, they’re nothing like as jogger‐friendly. That said, the Jabra Rhythm headphones aren’t bad. They seem well put‐together, and they sound fine, especially for speech and music from the dancier end of the spectrum. But the microphone is poor, so don’t buy them if you want to make calls from them, especially not while jogging down the Portway in Bristol.